Be it the spectre of sights seen, loves lost or simply the decisions we make along the way. Some can escape these apparitions, whilst others are doomed to be forever plagued by them. A dark folk tale laced with extraordinary comedic moments Old Stock: A Refugee Love Story follows stoic lovers Chaim and Chaya Moscovitch who are fleeing the Pogroms of Eastern Europe, across oceans to a new home on the snowy shores of Canada (Halifax & Montreal). Originally conceived by musician Ben Caplan and director Christian Barry in 2015 after hearing former Canadian Prime Minister Stephen Harper’s controversial comments about “old stock Canadians.” The two added playwright Hannah Moscovitch to help them work on a piece through Halifax, Canada theatre company 2B that confronted this concept, eventually devising a story based around her Jewish great-grandparents and their escape from Romania over 100 years before. “The stories, tragically, have not gotten old. It’s the same story, over and over again about people fleeing persecution, finding certain degrees of welcoming and certain degrees of hostility, in the place they’re fleeing to. And an extraordinary resonance in what’s happening today,” Caplan has said. Whilst the crux of the narrative pivots on the mistrustful nature of societies toward immigrants (often a hypocrisy given their own recent histories), this is also a story of ghosts. For Chaim (Daniel Oore) & Chaya (Mary Fay Coady) the phantoms in their nightmares appear in the form of the anti-Semitic violence wrought on Romanian streets, the loves lost on bleak Russian roads enroute to Canada, as well as the sheer weight of expectation & tradition. Knowingly set in a shipping container the action is narrated by the fanciful figure of Caplan’s ‘Wanderer’. ‘The Wanderer’ is a fearsome bearded raconteur who has the poetic showmanship of Nick Cave, the mournful soul of The National lead singer Matt Berninger and the profanity filled comedy styling’s of Billy Connelly. Its compelling theatre. 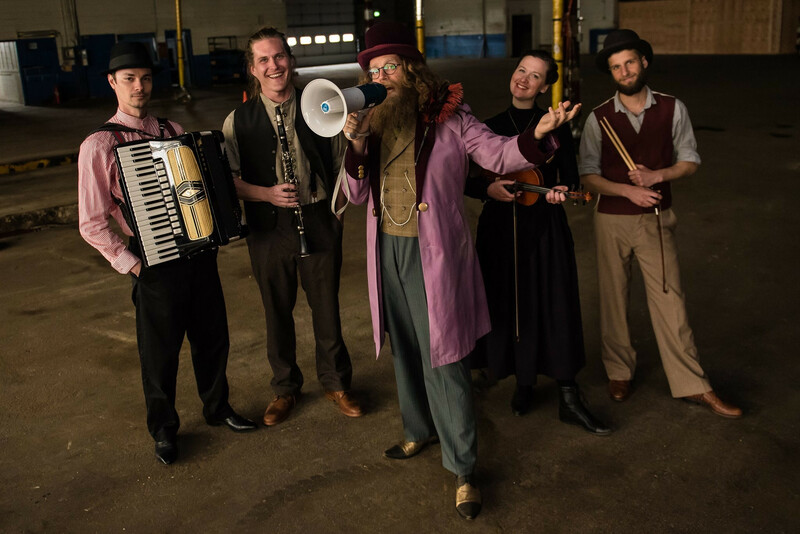 Combined with the formidable musical talents of Coady (violin), Oore (woodwinds), Graham Scott (keyboard and accordion) & Jamie Kronick (drums and percussion) they form an awesome Klezmer quartet. With lyrics that delight in a morbid expletive filled humour, it’s as funny & entertaining as it is heartfelt & thought provoking. So many lines appear to be thrown away in the bedlam but their tongue in cheek bravado betrays a deeper wisdom that illuminates their pathos. Do we have the strength to open our doors to the unknown stranger? Can we escape our pasts? Vital questions which are as poignant now as they were 100 years ago. A brilliant mix of music and mayhem, with enough stimulating themes Old Stock: A Refugee Love Story offers a little for everyone. If only we could do the same. To find out more and get tickets for the show then please click here. Tagged 2018, 2b, bristol, bristol old vic, Festival, Kevin Mcgough, love story, mayfest, old stock, refugee, refygee, review, the fix, the fix magazine, theatre, whats on. Bookmark the permalink.